Aired: Oct 3, 1988 to ? One night, a Star of Life falls down the chimney of a bakery nestled deep in the forest, causing the dough in the oven to come to life. The dough becomes Anpanman, a superhero made of anpan (a sweet roll with bean jam filling). 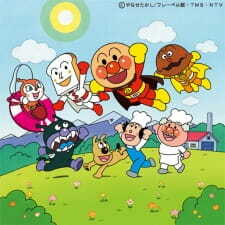 Together with his friends, Anpanman fights his rival Baikinman and helps the malnourished. Soreike! Anpanman (Let's Go! Anpanman) has been airing since 1988, and it's still marching on. It's not hard to see why. The animation is outstanding; the sheer simplicity of Anpanman's design is just so cute! Everything (and everyone) is smoothly drawn, no rough details, and his world looks amazing. As far as sound goes, it appears that some sound effects were later used by the 2005 Doraemon series on Terebi Asahi. I'm not marking it down for this, I'm just pointing it out. Voice acting is great; Keiko Toda (Anpanman) does a great job of voicing the character. There's also a lot of variety in their voice actors; from Melonpanna-chan's higher, kawaii-type voice, and Batako-san's positive, yet gentle tone, there's truly something special behind them. The music is amazing; at the start of the show, I can't help but sing along to the "Anpanman no Machi" every time I hear it. Every other piece of music (from background to ending credits) is well composed and placed, and combined with the sound effects and voice actors, it really stands out from his rivals (be it Shimajiro, Doraemon, Sazae-san or anyone else in the Kodomo anime field). The characters themselves are amazing; There's always something different about each one of them. They all have their own personalities, and none of them look like they were cloned or copy/pasted in. They are all very easy to relate to. In my opinion, this is one of the most enjoyable anime series that I have ever seen. I could watch it again and again, and never get tired of it. It's so open and accessible, and when the episode ends, I'm left begging for more. What a great show. One last thing to say - Bai-baikin! Oh dear, so many amazing voice actors in this show! Like all artforms, anime has been subject to censorship around the globe. The cases in this list, however, went beyond your typical TV edits and resulted in whole episodes or even full series being either banned by governments or withheld from broadcast due to outside pressure.